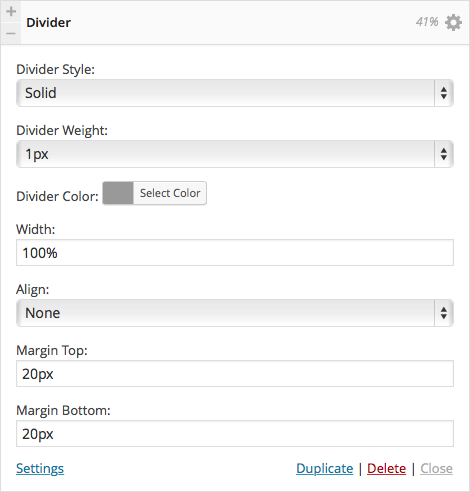 The Divider widget is very useful, it helps you create a visible / invisible seperation between contents, areas and all the page’s objects in general. It’s a great simple way to organize and position your site’s pages just as you want them. Divider Style: Choose in what style you’d like the divider to be: Space (create a blank space), Solid, Double, Dotted or Dashed. Divider Weight: Set the line’s weight, between 1-5 pixels. Divider Color: You can set a color to the divider. Width: Set the line’s width across the page. Align: Set the line’s alignment: Right, left, center or none. Margin Top: Here you can set the space between the divider and the content above it. Margin Bottom: Here you can set the space between the divider and the content below it.